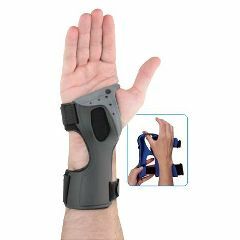 AllegroMedical.com presents The Exoform Carpal Tunnel Wrist Brace. The Exoform Carpal Tunnel Wrist Brace lightweight low profile design is 20% less circumferential bulk than other brands and promotes greater patient compliance. The exo-skeleton is contoured to ensure an anatomically correct fit and is designed to provide smooth controlled resistance to extreme range of motion. It is pre-shaped into a neutral position for comfortable limited motion/flexibility. The exo-skeleton provides radial and ulnar styloid relief, provides more room at the base of the thumb, the palmar crease and 5th MP. Small - Wrist: 5 1/4" - 6 1/4" - Palm: 6 3/4" - 8"
Medium - Wrist: 6 1/2" - 7 3/4" - Palm: 8" - 9 1/4"
Large - Wrist: 7 3/4" - 10" - Palm: 9 1/4" - 10 1/2"
Lightweight. Sturdy. Easy Storage. Stabilizes. Effective. Safe. assisting me in sleeping . Lightweight. Easy To Use. Effective. the palm side of device wears out quickly. good item for the price paid; does help. Lightweight. Easy To Use. Effective. Stabilizes. Safe. Easy Storage. Sturdy. Lightweight. Stabilizes. Effective. Easy To Use. Looks better than most. Sturdy. Easy Storage. Safe. Average Health. Athletic. Casual/ Recreational. awesome light wieght . How do you wash this item? This brace is made from a hard plastic (yet soft too--sort of like a dashboard,)and I am sure soap and water can be used on it as well as many other agents. I use mild soap and a hand brush to remove sweat and dirt from the lining. If you have sensitive skin be sure to use unscented cleaners and rinse well. Yes, these braces sappear to be waterproof. Yes, but the lining will retain moisture and cause skin to soften. I've used the Exoform Carpal Tunnel brace. Which I think it's the best! I have another problem - my right hand is slowly turning to the right/Ulnar Deviation. Each of the braces/splints are too heavy/uncomfortable or too flimsy. I've looked @ your website & don't see anything. Would you ever consider making a brace/splint for the drift of the Ulnar Deviation? Made of the same material of the Exoform Carpal Tunnel brace except longer so the fingers do not drift to the right. The dr I go to for my hands I've shown her your Exoform Carpal Tunnel brace . She loves it not only bec it's light but it works. Both of us would love it if you would consider making a form for the drift of the Ulnar Deviation. I'm sure I'm not the only person who has this problem. I'd gladly be your test person. Please let me know? I hope you would consider this solving this problem? If not could you direct me to another co but I'm so taken by your Exoform Carpal Tunnel Brace. To me that brace is the only brace I would wear. My wrist measures 6 1/2 inches. Am I a small or a medium? I think you would be a medium. I got the smallest, and it fit perfect. I am very small, and think wrist measures about 5". I must say I loved the product, until I lost it somewhere in Cambodia. Better then any other wrist brace I have owned. I'd say a medium. I basically have the same measurements & I wear a medium. My wrist measures 7 1/2 " and I think I ordered a large..not sure. I wore the brace only at night since that was the only time I experienced any symptoms. I would order the medium if I were you. The velcro straps are extra long and can be pulled tight if needed. I wore this brace for 9 months until my symptoms were so bad I had the surgery. All is well now. This is an excellent product, especially for sleeping! i need left exeform cerpal tunnel wrist brace. are you have? It is less rigid, and I love it. I tried the metal one but it is too hard for me. These are the only braces I liked and when I wore the first pair out I bought the same again. Still love them! I would say is just as rigid. I have both type but I like this one better I don't sweat as much. How do you determine the size needed? ACTUALLY I JUST GUESSED BASED ON SIZE OF REGULAR GLOVES I HAVE WORN IN THE PAST TO DETERMINE HOW IT WOULD FIT AROUND MY THUMB. Simply measure your wrist and compare to the size chart. Even if you get one a little too large, the velcro straps and long and will adjust well. Measure, I guess. See first question. Thank you for your note. This is probably the first company I have ordered much needed items from that came the very next day. I could hardly believe it! I have referred your company to Concord Hospital, Concord, NH as many, many patients go home on a daily basis with only a scant supply of dressing materials and advice to use gauze if unable to find the product needed. I went on line, found you folks and the rest is history. Thanks again for a great product and the most timely shipping policies I have ever seen.